News – Page 4 – Capital Blues Inc. It was with great sadness that we learned of the death of former club member, Steve O’Connor, earlier this week. He had undergone major surgery last year to remove a large brain tumour but unfortunately succumbed to another tumour which was only discovered a few weeks ago. Steve joined the club in 2007 and, together with his wife Cheryl, had worked on the club committee before moving back to New Plymouth in 2010. Steve was a very talented guitarist and could play a wide range of styles but his first love was the blues – having a real appreciation for early Fleetwood Mac material along with the other 60’s Blues Boom players. Being brought up in England in the 60’s, he was also fortunate enough to have seen many of these bands when they were still touring. Since leaving Wellington, Steve and Cheryl would make regular trips back to the capital and always coincided these trips with a jam night at the Bristol. He loved getting up and playing with the house band. The last time they were down Steve brought his Les Paul and played several of the old Mac songs – and despite still recuperating from surgery at the time – put on a stellar show. Our sympathy goes out to Cheryl and his two children, Liam and Kerry. 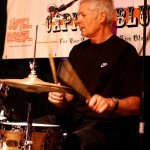 It is with great regret that we say farewell to Earl Pollard – a wonderful man, a great drummer and a friend to many. We send condolences to his family. Earl played many a gig at Roomfulla Blues with band leaders Bullfrog Rata and Laura Collins. From all who played music with him, and from all the audiences who enjoyed listening to him, may Earl rest in peace – we’re sure he’s in drummer heaven. 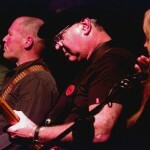 Don Laing has been capturing some great photos over the last few years of bands playing for Roomfulla Blues. VIEW his Flickr gallery.